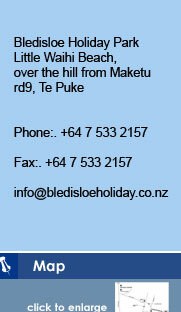 Bledisloe Park: Has good clean and tidy Facilities. Two large kitchens and cooking areas, two laundrys, two large shower and toilet blocks. Bledisloe Holiday Park is virtually surrounded by water - With 104 powered sites, 45 tent sites and 14 cabins - you will have no trouble finding a great spot for your Caravan or Motor Home or to pitch a Tent. Tidy Onsite Caravans are also available for rent.